Managing serial port devices can be a real pain. Monitoring the data exchange process between the device and the computer, logging and structuring serial data into a database - that's the brief common task list of any automation engineer. And ironically, these tasks aren't easily automated by themselves. Doesn't that sound strange: an automation engineer doing everything by hand, not being able to lighten his job a bit? Our RS-232 Data Logger works absolutely transparently, without a user intervention. It receives information from a RS232 port device, processes it, splits the flow to individual data blocks and logs them to a database, or sends them via DDE or OLE technologies to any application of your choice. Moreover, it can also handle the data anyway you want - filter, process, format - the scope of applications is only limited with your imagination. And that's all done completely automatically! 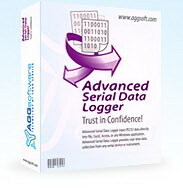 As the name suggests, Advanced Serial Data Logger is an RS232 data logger in the first hand. Each and every step of the process is thoroughly recorded, so it is not a problem anymore to locate and eliminate any possible problems, or monitor emergency alerts. You can create a plain log file, or format it by date, size or data type. 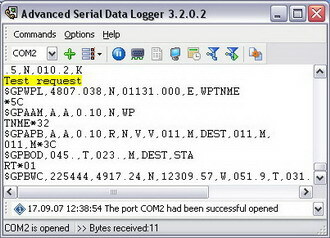 Advanced Serial Data Logger can also work as a sniffer capturing and logging all information circulating between serial port devices and the computer. Our RS232 Data Logger supplies several cut down versions. Some versions omit some of the advanced features found in the Enterprise edition and is ideal for users who either want a low cost or free solution or are not interested in more advanced features. Read more here.